José Luis Rodríguez Zapatero was born in 1960 in the city of Valladolid, north of Madrid. His family were of Castilian background and were originally from the city of León. His father was an attorney; his grandfather had been killed during the Spanish Civil War of the 1930s. Spain had established a republic in 1931, with the king abdicating his throne, but civil unrest continued, and reached a crisis point by 1936. A military officer, Francisco Franco, attempted a coup, and a bloody war ensued. Zapatero's grandfather, who fought on the Republican side, was slain by Franco's soldiers during the first weeks of the war. By 1988 Zapatero had been elected secretary-general of the PSOE chapter in León province. Over the next decade he worked to reform the party from inside, as a response to the corruption scandals. He and a coalition of other like-minded PSOE politicians urged a modernization of the party's platform, modeling it after Tony Blair's remake of the Labour Party in the mid-1990s. The reform movement gained momentum, but the PSOE failed to beat Aznar's party in national elections held in March of 2000. The head of the PSOE at the time, Joaquín Almunia, resigned as a result of the poor showing, and at the next party conference that July, PSOE delegates elected Zapatero as their new national secretary-general. Elizabeth Nash, a writer for London's Independent newspaper, quoted Zapatero as saying he would personally "lead this party once more to victory and the biggest one in its history." He added, "We need change, tranquil change. Our hope is for victory in 2004." On 1 January 2010, Spain assumed the Presidency of the European Union for the first six months of the 18 month 'Trio' along with Belgium and Hungary. 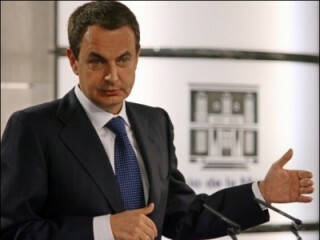 Within days, Spain's web site for its Presidency www.eu2010.es was defaced by a picture, the supposed resemblance of Zapatero although the XSS attack lasted only several hours.